ANNAN, SCOTLAND (ANS – September 30, 2018) — Brought up in a Christian home, taught to say ‘The Lord’s Prayer’ at the age of three and respect The Holy Bible this is the background of prolific author Claire Ollerton of Annan, Dumfriesshire, SW Scotland. However there is a bit more to this author’s history and some of it appears in her new book ‘Walking God’s Way’ which she has been told by a couple who have purchased the book and many others who feel the same way that it is the best book she has ever written but Claire says it was written with The LORD’s help so it had to be a good one and all the credit goes to Him. Claire’s imagination regarding writing re her children’s books started when her mother told her bedtime stories that she had made up and there was a particular one about one of ‘the little people’ who wore a green hat and it had a large orange feather in it and whenever he put the hat on it tickled his nose and Claire wouldn’t go to sleep until her mother had told her another adventure about him! She started writing after being encouraged by her primary school head teacher to enter an essay writing competition organized by Cadbury’s Chocolate manufacturers in 1956 when she won first prize for excellence and of course some chocolate after which she entered another one for Brooke Bond Tea manufacturers but this time she had to draw and paint a picture of people unloading tea chests from a ship plus supply an essay to go with it for which she received third prize which was a book token. Then she asked the children if he was right and a sea of hands went up to tell Simon that he was wrong. Later that afternoon and on subsequent afternoons they were treated to a story that she made up as she I went along always ending in a prayer and on one occasion a little boy said, ‘Miss, Simon’s eyes are still open.’ To which she answered, How do you know? [because he was supposed to have his eyes shut!] so he quickly shut his eyes! At the end of the session the supervising teacher said to her, ‘Why don’t you write that story down – it’s very good?’ I did and I illustrated it but as yet it hasn’t been in print. ‘No,’ she replied, ‘We placed in the arms of a child who had been in a coma for the last three weeks and suddenly one of my nurses saw the child’s arm move in a stroking action and the child woke up and said, “Teddy.” However she had to take care of my dear mother who had colon cancer so no more bears went but after my mother went to be with The LORD she moved to Annan in 2000 and on her first visit to Dumfries & Galloway Royal Infirmary as an outpatient she went into the hospital fundraising shop and there on a shelf in front of her was a little bear looking at her so she asked the assistant to take it to the children’s ward for her as she had drops in her eyes, this happened again but the assistant told her to take it up so she did. Later as she was recovering from a glaucoma operation a nurse came in and said, ’You’re the bear lady!’ apparently the nurse had been working in the children’s ward so the name stuck and she has been taking them there ever since. In 2010 she was doing some research and contacted Ms. Rhonda Fleming [Carlson] for her latest book at the time and discovered that Ms. Fleming is a Christian; then she discovered that Rhonda had set up a unit for homeless parent and child/children at PATH [People Assisting The Homeless] in Los Angeles so Claire prayerfully decided that the children there should also have some bears and particularly at this time as some are badly traumatized with the current wildfires so they go to those children as well. 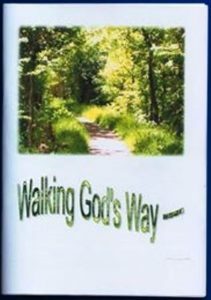 There are details in ‘Walking God’s Way’ with reference to that, inspired recipes, a song and a poem and all kinds of information to help build your faith. The books are available on Amazon and there is an American English Version available ISBN 978 1 898936 65 7 as well as the English Version ISBN 978 1 898936 27 5both cost £7.00 each + p&p but if you reside in the UK please contact Claire at info@steadfastministries.co.uk for details on how to get one direct leaving your name and address and contact number. [No data given is transferred to anyone else]. Each book sold pays for a Teddy to go to a child any excess amount given helps to pay for printing costs and is gratefully received.